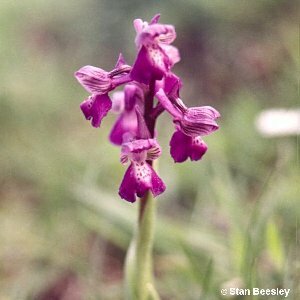 The Green-Winged Orchid (Orchis morio), also called the Green-Veined Orchid, is restricted in Northern Ireland to just one sand dune site in County Down where it was first discovered in 1976. It grows in short maritime turf on flat or slightly undulating sand close to the sea shore. 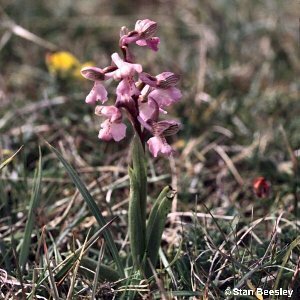 Within the British Isles this orchid is mainly found in the southern half of Ireland and the southern half of England and Wales, so the County Down site is outside the main area of distribution, being farther north than usual. Temperature probably determines the northern limit of growth, but coastal sites would be milder than inland at the same latitude, which may partially explain the species' presence in Co Down. This orchid flowers in June and is superficially similar to the Early Purple-Orchid (Orchis mascula), but has green stripes on the two lateral sepals. Although most plants have purple flowers, some produce pink or very pale flowers instead. Elsewhere in Ireland this species is in decline. It is often associated with limestone-rich eskers and gravel pits. All names: Orchis morio L.